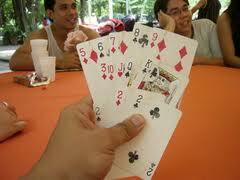 Tong-its is a card game that originated in Luzon which happens to be the largest island in the Philippines. Tong-its can be associated with the American card game Tonk. In this card game you have to empty your hand of all cards or minimize the counts and the scores of unmatched cards that are still on the player’s hand by forming card sets, dumping cards and calling a draw. All players are dealt 12 cards while the dealer gets 13 and the rest of the cards are left as a central stack. The game begins when the dealer dumps a card and the next person can either pick up the disposed card or get one from the central stack. Players collect hand combinations and dump unnecessary cards.The player who gets rid of all cards or has the least number of total points at the end of the game wins the game.